We have been going to Bageltown for years, and in our opinion, it remains the best in the area. There is almost always a long line nearly out the door, so I guess others would agree! On a busy weekend morning, you can probably expect to wait 15 minutes. When you first walk in, you see the tall L shaped display case with salads, cream cheeses and the like, followed by pastries, cookies and bagels once you turn the corner. There are always a lot of people working so the line is kept moving. Many of the girls working look like they're in high school, and unfortunately with that sometimes it seems they are more concerned with carrying on conversations than helping the customers. It rarely happens when we are there, but it does happen. The aisle for the line is shared by those leaving and the refrigerated case for salads, parfaits, beverages, etc., so at times there is a little squeeze to get out. Behind the counter is the kitchen, and past the counter is a seating area with large and small booths as well as the restroom. There's not a ton of seating, but we've always been lucky enough to get a table even when it's busy. Everything we've ordered has been delicious. Breakfast egg sandwiches are great, but you'll have to wait a little extra time, because the person helping you will likely help someone else, and come back to you once the bell is rung saying your sandwich is done. 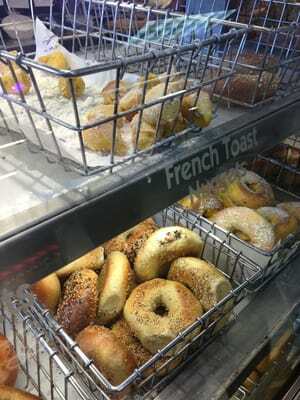 Bagels are all fresh and some of our favorites are the Everything, Egg Onion and French Toast bagels. Just like many quintessential Long Island bagel places, the cream cheese or butter is piled on, unless you ask otherwise. I usually order the Vegetable cream cheese, which has perfectly sized veggies in it. I've been to some places where scallions are long, pepper pieces are huge, and it's just not enjoyable. Bageltown is the complete opposite of that! Tuna salad is excellent, on a bagel or a roll, or even on a delicious onion pocket for a flavor party in your mouth! They make the coffee behind the counter, and if you ask for light and sweet, they are heavy handed with the sugar so if that's not your thing, I would specify how much you want or get it black and prepare it yourself. They offer flavored coffees as well, rotating different flavors every now and then. For us, the coffee is more like a once in a while kind of thing, a treat. Prices seem in line with most bagel places, but kitchen items can get a little pricey, but I think that goes for any deli or bagel joint. Lines are long for a reason, so if you don't mind the wait and you're in the area, it's worth trying!